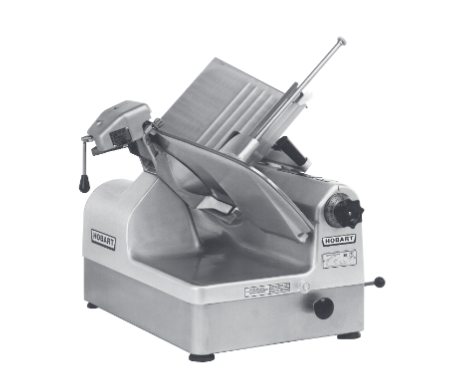 From delis to restaurants, meat slicers are an essential in a lot of commercial kitchens and establishments. Hobart makes some of the best slicers in the foodservice industry, making food prep quick and easy. In order to keep them in top shape, cleaning and maintenance is key. While there are universal tips for cleaning a meat slicer, certain Hobart models have specific instruction. 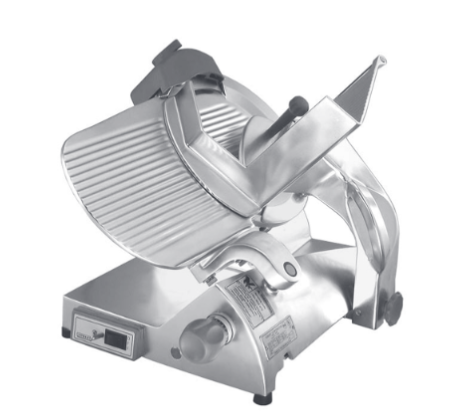 Below are steps for how to clean a Hobart meat slicer. In this guide, we offer procedures for 1612E/1712E, 1812/1912, EDGE and HS models. Make sure to wear protective work gloves throughout the entire cleaning procedure. Start by turning the machine off and unplugging the power cord. Turn the index knob fully clockwise to close the gauge plate. Dip a clean cloth into a combination of detergent and warm water. Then, wipe down the surfaces of the meat slicer with the cloth. Once you’ve cleaned the surfaces thoroughly, rinse them with fresh water. Soak a thin cloth with mild detergent and hot water, and insert it between the ring guard and knife. With your right hand above and left hand below the gauge plate, hold the cloth with both hands and work it between the ring guard and knife. Pull the cloth around the entire ring guard. Make sure to repeat the process to completely remove any residue and particles. Use a clean cloth with a combination of warm water and detergent. Wash both sides of the knife by wiping away from the center. Rinse with a separate cloth and warm water following the same wiping procedure. Dry the knife once it’s clean with a dry cloth. Take off the top knife cover by rotating the latch knob, and remove the deflector from the machine’s knife support. Once those components are removed, take off the sharpener. Wash each part using a cloth, warm water and detergent. After residue and particles have been cleaned off, rinse by wiping the parts with a separate cloth and warm water. Once they’re dry, reassemble the top knife cover, deflector and sharpener on the machine. Check out the 1612E/1712E and 1812/1912 operation manuals for more removal and assembly help. 1612E & 1812 models – Raise the index knob end and support it with the cleaning leg. 1712E, 1912 and select 1812 models – Raise the lift lever past the center to its stop. Read a bonus lubrication tip below. Put on protective work gloves throughout the cleaning process. Start by turning the machine off and unplugging the power cord. Turn the index knob fully clockwise to close the gauge plate. Soak a clean cloth into a combination of mild detergent and warm water. Then, wipe down the surfaces of the meat slicer with the cloth. Once you’ve cleaned the surfaces thoroughly, rinse them with fresh water. Carriage tray – Close the gauge plate by pulling the carriage to the front. Then, unfasten the knob and lift the tray straight up. Knife cover – Unscrew the knob on the knife cover. Remove the rod and life the cover free from the guide pin. Deflector – Unfasten the hex-headed pin. This should allow you to slide the deflector down and clear the pin. Sharpener – Light sharpener straight off its post. Check out the EDGE operation manual for more removal and assembly help. Clean each part in a sink using warm water and mild detergent. A non-abrasive dish soap works as well. Scrub carefully using a cloth or soft-bristle brush. Make sure to wipe any residue inside the sharper housing on the machine. Once each part is dry, reassemble accordingly. To clean around the area thoroughly, take a moistened, folded paper towel and work it between the ring guard and knife. Then, insert the paper towel at the ring guard’s base and manually rotate the knife. While the knife rotates, the paper towel will wipe the guard and edge of the gauge plate. 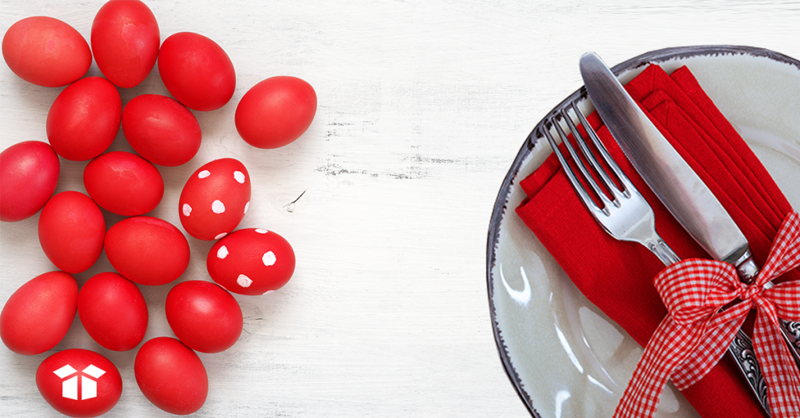 Clean the knife using a mild detergent and a cloth or soft-bristle brush. Make sure to wipe from the center of the blade motioning outward. Then, clean out the knife cover hold using a tube brush. Once the residue is removed from both areas, rinse using a separate cloth or clean brush. Raise slicer and swing the cleaning leg under the machine straight down. When the leg comes down, pull it all the way to front. The machine should be completely supported. Using a damp cloth with warm water and detergent, clean underneath the machine. Then, rinse and dry using separate cloths. Sharpener – The sharpener is on the top of the slicer. Disassemble by lifting the sharpener straight up. Meat grip – The meat grip is on the product tray. To remove the grip, hold the meat grip handle and unfastening the slide rod from the product tray. Then, loosen the meat grip handle. You’ll be able to remove the handle, grip arm and washer from the meat grip. Product tray – With the gauge plate closed, pull the product tray toward the operator. Loosen the support arm’s knob, and tilt the tray to the right. You can either clean it in the open position or by removing it. For full removal, grasp the tray with both hands and lift straight up. Top knife cover and ring guard – Take off the top knife cover by pulling the latch knob. This will help release it from the magnet. Then, remove the ring guard cover by simply lifting up. Knife (removable only) – With the gauge plate closed, rotate the knife unit its arrow aligns with the pin on the ring guard (1 o’clock position). The ridge on the slicer’s knife hub also will be aligned with the pin. Place the knife removal tool on the knife, fitting the tools three slots onto the three pins on the ring guard. The removal tool also has a pin that should fit into a hole on the knife (11 o’clock position). Once the tool is in place, push the handle firmly all the way into the hub. Turn the handle counterclockwise until it locks. Then, lift the knife and removal tool up and out. Check out the HS operation manual for more removal and assembly help. Sharpener – Start by wiping off residue in the sharpener housing using a moist cloth and mild detergent. Then, wash the sharpener in a dishwasher or by hand in a sink. If cleaning in a sink, run warm water to wash and rinse. Use mild detergent and a cloth or soft-bristle brush when scrubbing. Meat grip – Clean in a sink by running warm water to wash and rinse. Use a cloth or soft-bristle brush when scrubbing. 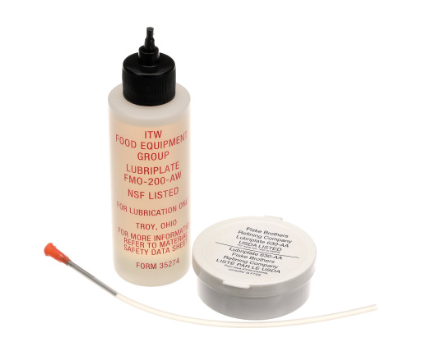 Product tray – Clean in a sink by running warm water to wash and rinse. Use a cloth or soft-bristle brush when scrubbing. Also, use a tube brush the clean the product tray’s pin. Top knife guard and ring guard – Wash both parts in a dishwasher or by hand in a sink. If cleaning in a sink, run warm water to wash and rinse. Use mild detergent and a cloth or soft-bristle brush when scrubbing. Knife (removable) – Wash the knife and knife removal tool in a dishwasher or by hand in a sink. If cleaning in a sink, run warm water to wash and rinse. Use mild detergent and a cloth or soft-bristle brush when scrubbing. Knife (non-removable) – Start by cleaning the ring guard area thoroughly. Take a moistened, folded paper towel and work it between the ring guard and knife. Then, clean the knife using a mild detergent and a cloth or soft-bristle brush. Make sure to wipe from the center of the blade motioning outward. Once the residue is gone, rinse the knife and guard area with a separate cloth or clean brush. Once all parts are dry, reassemble them back onto the machine. The HS operation manual has more instructions on these procedures. HS6 and HS8 – These slicers us a cleaning leg. 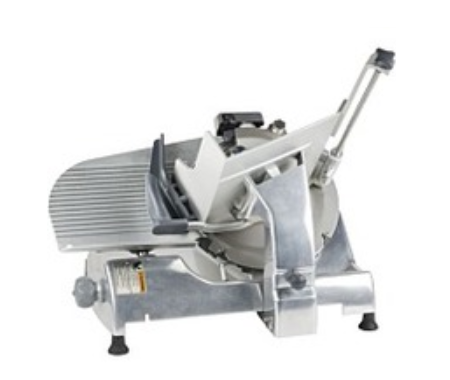 As you lift the slicer from the front base, the cleaning leg will swing straight down. Pull it all the way to the front, allowing the machine to have space for cleaning underneath. HS7 and HS9 – These slicers use a gas-assist spring. Place your hands under the front base, and lift up until it stops. The machine will stay raised. When finished, push down on the base to lower the machine. After cleaning and before reassembly, remember to lubricate your slicer. 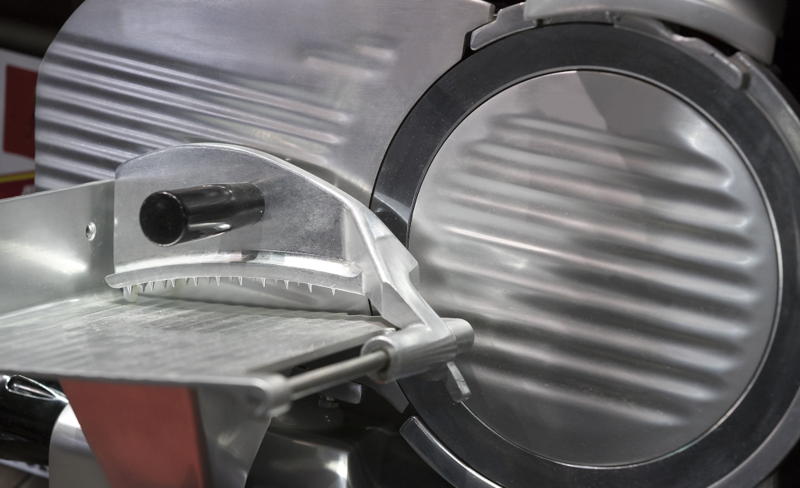 Lubricating slide rods, meat grips and other parts of the slicer not only extends the life of your machine, but it also helps put less stress on your slicer blade between sharpening cycles. Need more help cleaning your Hobart meat slicer? Check out our collection of Hobart manuals online.